When playing sports, padding, helmets and protective gear are a must to prevent injury and ensure a happy, safe experience. But there’s one piece of equipment that is arguably among the most important, and yet is most often forgotten: the mouth guard. At Overland Park Dental, we frequently see tooth and mouth injuries due to lack of protective mouth guards. We encourage all of our patients active in sports to get mouth guards. We’d much rather fit you for a mouth guard than fix broken teeth. According to the American Dental Association, mouth guards can prevent up to 200,000 oral injuries annually. But 67% of parents report that their children do not wear them while playing sports. This is unfortunate, because without mouth guards, your chances of injuring your teeth becomes 60 times more likely. 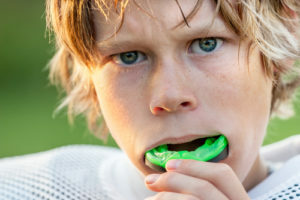 Wearing a mouth guard is a necessity if you want to avoid permanent damage to your teeth during a game, especially sports with a lot of player-to-player contact such as hockey or football. A mouth guard serves as a cushion around your teeth. In the case of impact, it absorbs shock and deflects excessive impact, reducing the chances of teeth being broken or dislodged. They can even prevent damage to other areas in the mouth. Painful bitten lips or tongues are much less likely with a mouth guard. It even protects against jaw fractures, helping you to stay in the game. The best kind of mouth guard is one that’s properly shaped to your teeth for a personalized fit. These mouth guards provide the best protection possible. Overland Park Dental is skilled in crafting custom mouth guards for a wide range of ages, so contact us today to schedule a consultation. Our goal is not only to help you save on expensive dental work, but also to keep you happy, active and pain-free. Call us at our South office (913) 647-8700 or our North office at (913) 341-2380 or schedule an appointment online.